Multnomah County officials are converting a motel to house 40 homeless families, complete with support services, and also have finalized the purchase of a building they call a crucial missing piece of greater Portland's system of dealing with homeless people in mental health crisis. 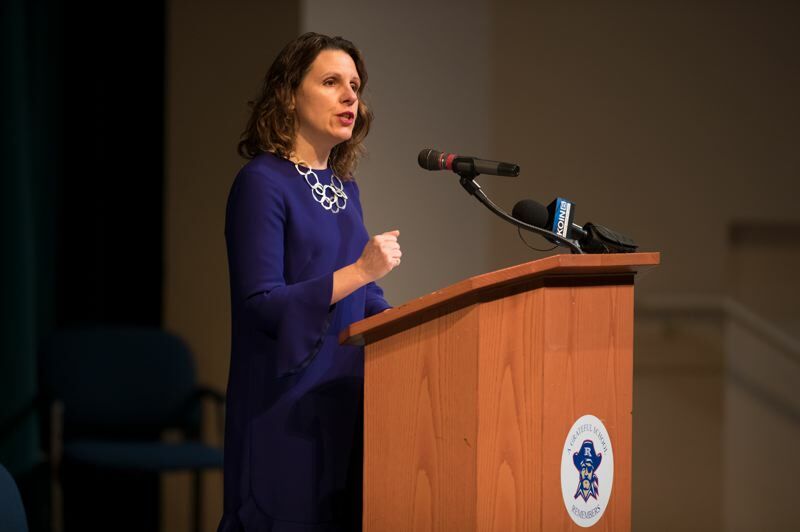 The details were made public on Friday, April 12, by county Chair Deborah Kafoury at her annual State of the County speech. The significant expansion will address challenges that had previously gone unmet, she said. Purchase of the Bushong building downtown, at 333 S.W. Park Ave., plus an adjoining parking lot, went through Monday, Kafoury announced at the City Club of Portland event held at the Sentinel Hotel downtown. The building will be used for the type of facility that has "eluded us for years," she said, according to a copy of her speech released in advance. "We've had almost no options for people downtown experiencing mental health issues." She specifically addressed the plight of those discharged from the Unity Center for Behavioral Health, the regional psychiatric ward set up in Portland or people in crisis by a consortium of hospitals and health systems. "When people left the Unity Center, or lost their housing, the only choices were the least effective and most expensive ones imaginable: the emergency room or more often, our county jail," Kafoury said. The $5.8 million building will use a peer-run model to temporarily house and support people with no place to stay who have immediate needs or who aren't able or interested in being part of a shelter run on a more restrictive model. She also announced that the county has entered into a master lease to convert a motel into a facility with space for 40 families and support services, to turn our year-round family shelter system "into one where every family has the dignity of their own space." Kafoury said a partnership with the city of Portland has resulted in 600 units of supportive housing being either created or in process, with another 1,400 to come. The state of the county speech is by now a well-established ritual for the leader of Oregon's largest county, which has a more than $2 billion budget and employs 6,000 people. The event is typically attended by other officials and county employees, in addition to City Club members. • Criminal justice reform: Kafoury cited the county's use of a MacArthur Foundation grant to open up the Diane Wade House, a transitional housing program set up as an alternative to jail to help African American women access needed services. • Construction and pay: Kafoury noted that the county recently saw the completion of the nine-story health department headquarters in Old Town named for former Multnomah Commissioner Gladys McCoy. She noted that a new 17-story central courthouse building is going up at the west end of the Hawthorne Bridge. Between those and the Sellwood Bridge, she said, "we've invested more than $750 million in new construction in this community." But she said in the past year labor unions, subcontractors and workers had brought concerns about being shorted pay on construction sites. So the county is instituting a new "fair pay" initiative in which it will train contractors and use volunteers to ensure people are paid properly, she said. • Climate change: Kafoury said in the last year the county has cut emissions from county vehicles and buildings by 57 percent. The county also adopted a wood smoke ordinance and new rules to reduce diesel pollution on county construction sites. • Workforce diversity: Kafoury noted that the county has instituted a new workforce equity plan and complaint system with the help of employee input and consultants. • Opioids: Kafoury noted that in addition to filing a lawsuit against opioid manufacturers, the county has adopted prescribing guidelines for dentists that have led to a reduction of 80 percent in opioid prescriptions.